The National Museum of the United States Army (NMUSA) will tell the story of the Army and its work to protect our nation. It will also tell the story of the many ways the Army contributes to the lives of Americans beyond the battlefield. One of these ways is through medical advancements. Throughout the Army’s history, its medical personnel have played a crucial role in its success in war. In addition, medical advancements developed for the benefit of Soldiers have had a considerable impact on the lives of Americans and civilians worldwide. An exhibit in the Saving the Nation Gallery highlights Army medical practices during the Civil War. The massive size of the armies, the outbreak of contagious diseases, and advances in weaponry resulted in losses never experienced before in United States history. The Army’s response included the organization of field and permanent hospitals, creation of evacuation systems for the wounded, and innovations in nursing care. Innovations included the use of anesthesia, improved pharmaceuticals, and the crude beginning of sanitary procedures. The exhibit features a rare Hospital Corps steward’s frock coat, an Army-issue amputation kit and surgeon’s portable field set, and drug canisters for quinine and ether produced by Army laboratories. The Nation Overseas Gallery’s medical exhibit examines how the massive casualties of World War I required innovative medical support. The impact of modern weaponry led to a drastic increase in casualties. Faced with this new reality, members of the Medical Corps and the newly created Army Ambulance Service, Sanitary Corps, and Dental Corps worked tirelessly to care for American Soldiers. Artifacts include a medical officer’s belt with all of its original contents, an Ambulance Service stretcher, an ambulance company flag, and personal effects of a nurse serving in a hospital in France. An Army Mobile Surgical Hospital (MASH) diorama will be featured in the “Korean War” exhibit area of the Cold War Gallery. MASH evolved from a World War II hospital system developed for jungle fighting and amphibious operations. The first highly mobile MASH units arrived in Korea in July 1950, providing support close to the fighting in the Pusan Perimeter. The evacuation of seriously wounded troops was significantly improved by the addition of helicopter detachments to MASH units. Made popular by the movie and television show, MASH units provided vital surgical and medical support during this difficult conflict. The “Innovation and Invention” display in the Army and Society Gallery explores some of the many Army innovations that have become part of the civilian sector. Medical advancements are particularly pervasive as the importance of protecting Soldiers against disease allowed for finding ways to protect entire populations against disease as well. Army doctors during the Revolutionary War instituted the first compulsory program of inoculation to eradicate smallpox from the Army. 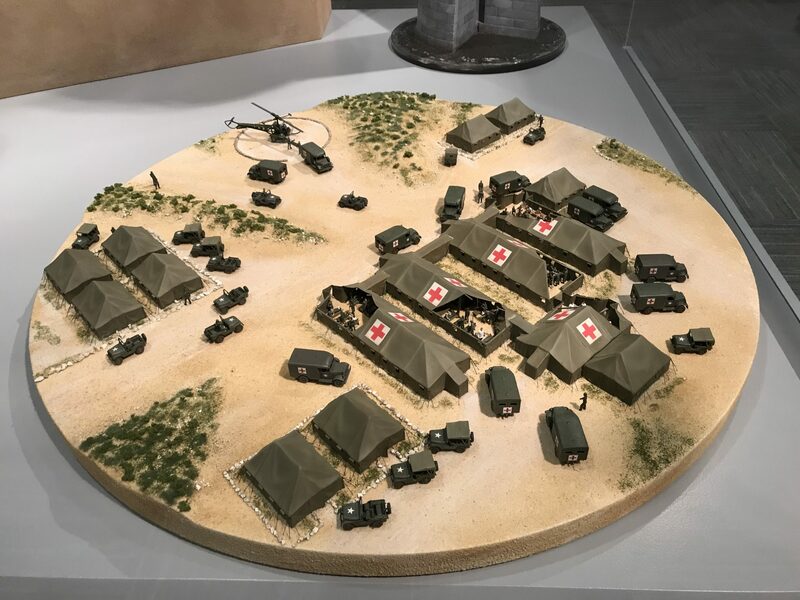 The display also explores how Army combat medics inspired the development of the civilian Emergency Medical Technician (EMT) program. The use of helicopters for evacuation of casualties was pioneered by the Army and is now in common use by civilian hospitals. In the Experiential Learning Center (ELC), the science component of the STEM-centered training stations is focused on identifying and containing different diseases to control their spread and contain them for cure. Visitors will be able to use computer modeling to learn different practices for how diseases are contained. A horizontal touch screen, resembling a lab table, provides visitors with the opportunity to interact with an engrossing disease identification game. The National Army Museum will tell the story of the Army, the whole story, including the many ways in which the Army has impacted our lives aside from protecting the nation from outside threats. Through medical advancements made to ensure survival on the battlefield, the Army has contributed to the greater medical community and helped the lives of many Americans and the world.